This stunning canvas features the Gothic Guardian artwork by the amazing Anne Stokes.The canvas is 2.. This stunning canvas features the Gothic Prayer artwork by the amazing Anne Stokes.The canvas is 25x..
An Anne Stokes Spirit Board in an Gothic Prayer design. The back of the board features a sentimental.. This stunning clock features the Hatching Time design which has all the baby dragon images.1x AA bat..
Hazel's unfurled wings the colour of autumn leaves, this young fairy wears a red dress that flares o.. This stunning canvas features the Kindred Spirits artwork by the amazing Anne Stokes.The canvas is 2.. This stunning canvas features the Light in the Darkness artwork by the amazing Anne Stokes.The canva..
Coming from the magical imagination of the fantastic Lisa Parker, this fantastic 2018 Calendar is no.. 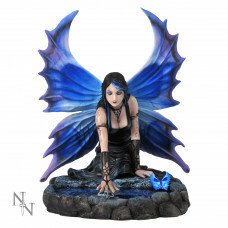 Wearing a crown bearing a skull, this gothic fairy stares at you longingly, her red-and-blue tinged ..